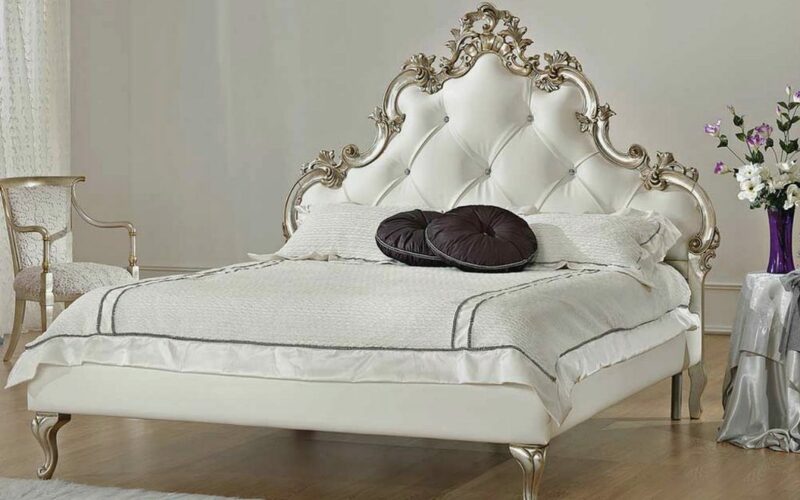 SARA by ORSITALIA: contemporary stylized baroque bed, with high tufted bedhead, in solid Beech wood, upholstered by hand, 100% Italian production, custom-made contemporary baroque beds suitable for home and for hotel. 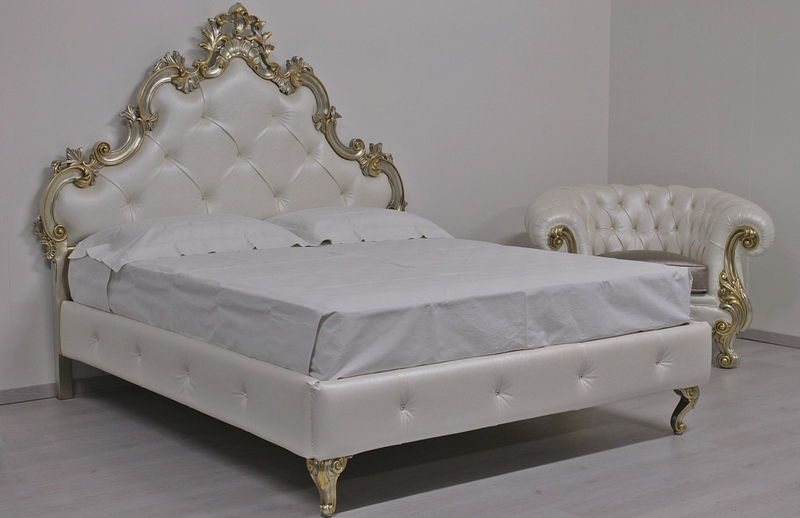 Orsitalia presents theirs italian custom and tailor-made beds, nightstands and chest of drawers in luxury New Baroque style into Sara bedroom collection. Orsitalia produces the Sara’s wooden pieces of furniture in Italy, in Brianza Area (close to Milan) birthplace of Italian modern and classic Designs. Orsiitalia customize contemporary bedrooms model Sara with a wide colors palette for the wood and with a wide choice of textile and leathers for the covers. 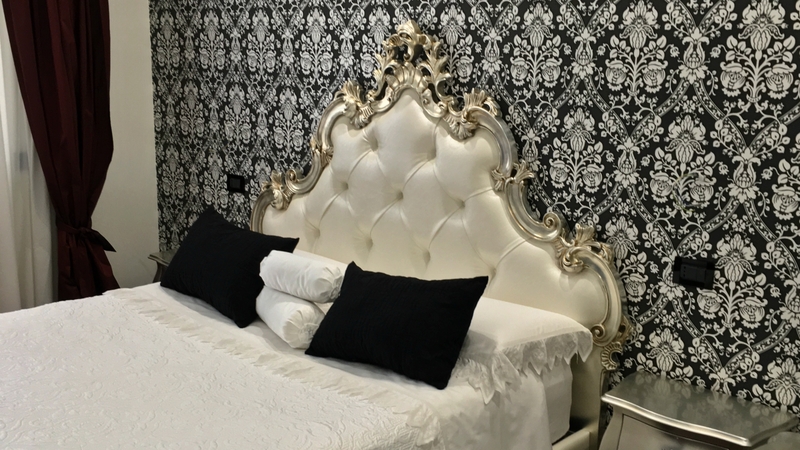 Sleep like a queen or king in Orsiitalia’s baroque beds! Orsitalia’s team will suggest you the best technical and designs solution for your living project and they will also be able, thanks to their decennal experience, to supply you with decoration items matching to the whole project. Container bed: available in few sizes for matress of cm. 160 and cm. 180 x Length 190 or 195 or 200 cm. 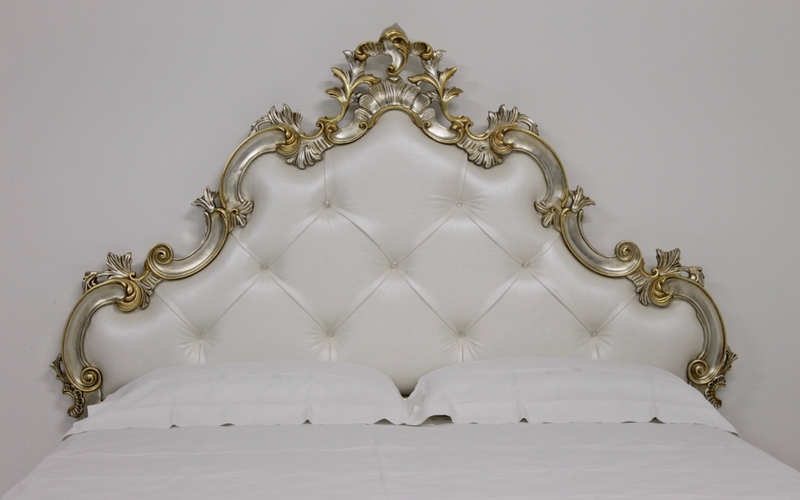 Upholstered bedframe: available in few sizes for matress of cm. 160 and cm. 180 x Length 190 or 195 or 200 cm. Small Nightstand hanged to the wall: W. 56 x D. 23 x H. 55 cm. Big Nightstand hanged to the wall: W. 81 x D. 31 x H. 75 cm. Double Bed with headboard and feet in strong selected carved wood. Wooden slat supplied and it is putted on solid metal corners. 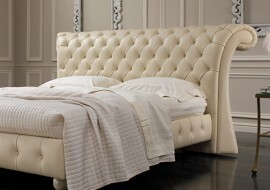 Bedhead, bed base or storage base Upholstery: handmade and it is possible to choose between tufted or smooth. 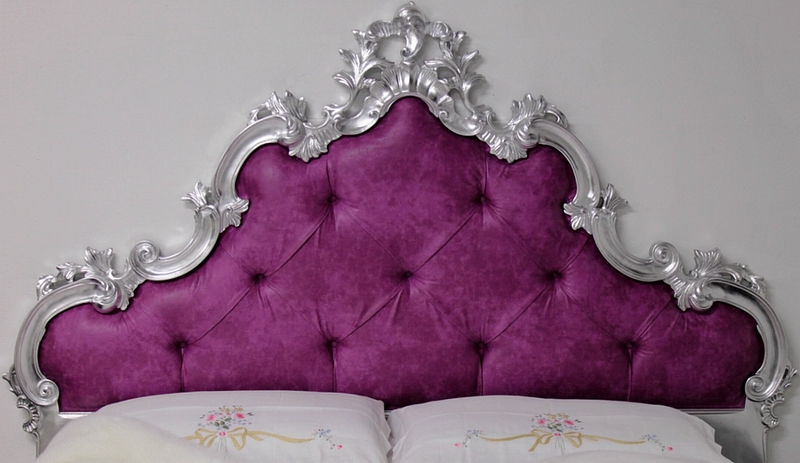 For the bedhead's quilting we can offer Swarovski crystal buttons, metal studs or normal fabric/leather buttons. The shape of the embrodery can be customized. 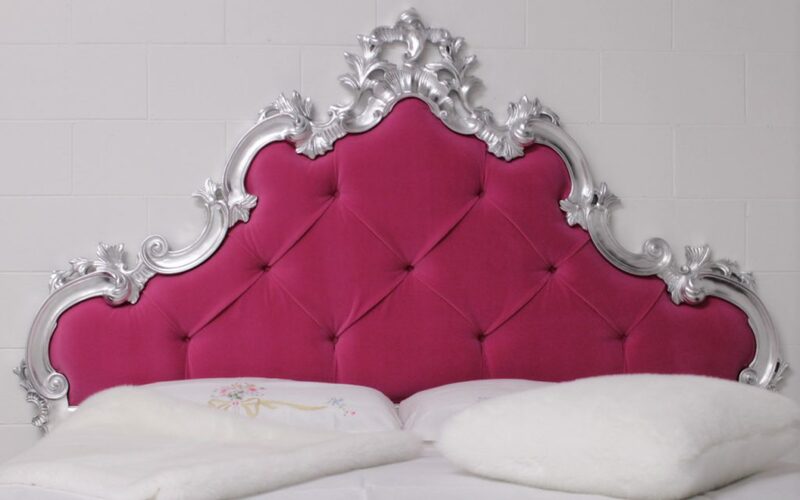 The Queen, King or Super king Size double bed is delivered disassembled with easy and fast construction (metal angles for support of slatted bed already climbed on bedframe), just four bolts to put. The beds with storage base are delivered already assembled, you have just to hang the bedhead to the base on harware already fixed on it. 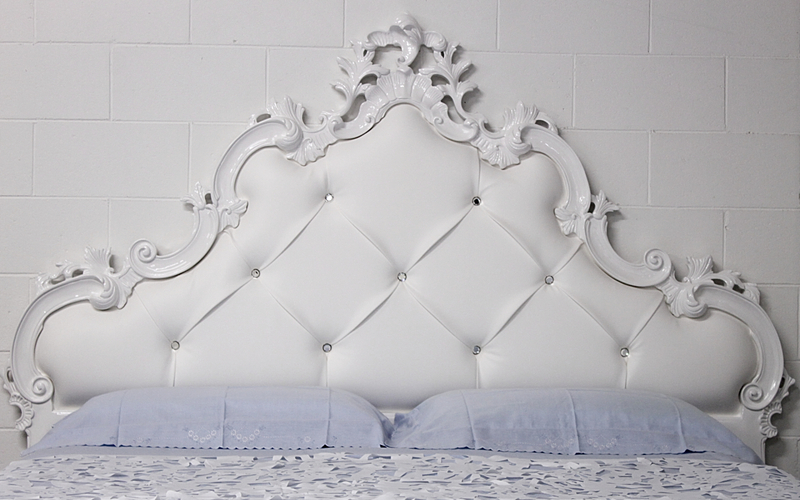 ORSITALIA offers the possibility of customizing every slight detail of our models. Upholstery: ORSITALIA offers more than 40 different leathers and textiles, such as cotton velvet, fire proof velvet, silk satin, linen satin, damask velvet, eco leather even fireproof, genuine leather, eco fur. 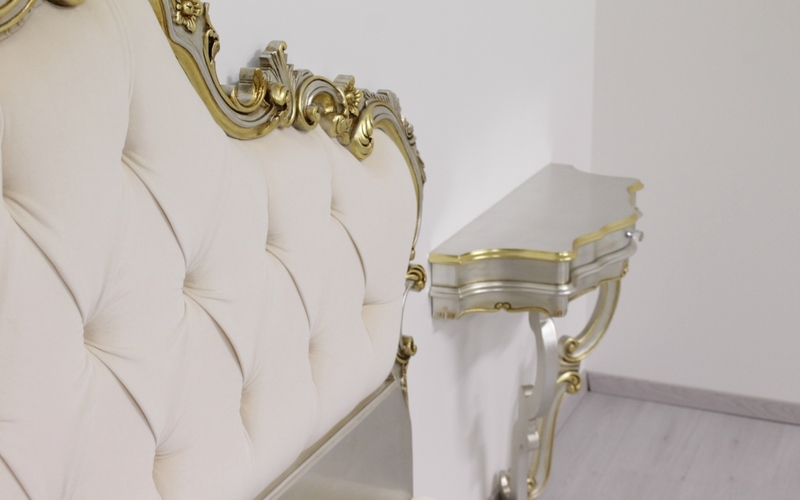 Finishing: ORSITALIA offers custom-made solutions also for buttons and for the finishing touch of the upholstery as: different kinds of trimming, different kind of ribbons or different kind of nails. For wood: Vacuum cleaner or soft dry cotton cloth. Remember the wood is alive, do not use harsh household cleaners. For Velvets, wool, linen, satin: Vacuum cleaner or dry cleaning.